Our relationship with Florence Elkouby begins with an email, sent by… her daughter, Alice! An original gift, to say the least, thought up by the eldest of the siblings, anxious to please a mother who is a fan of decoration. 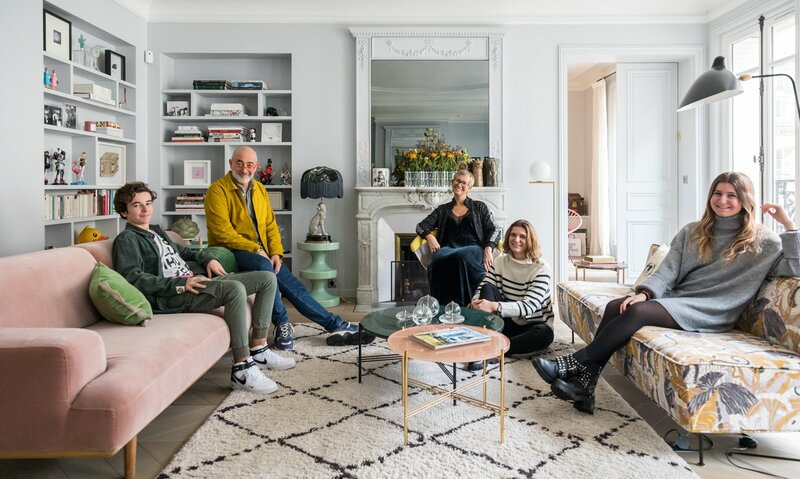 A few exchanges later, and here is part of our team in the vast space located near the Jardin des Tuileries 200m2 of colours and details underlining the specific features of a Haussmann-style apartment with a total brilliance that is powered by the overflowing energy of our hostess for a day. Florence Elkouby is a great way to start our year! Always smiling and accessible, the co-creator of L’Appartement Parisien (an agency which specialises in branding, image, packaging and product) embraces, as her philosophy, “the art of wrapping”. Where the way to enhance a little something is by hijacking it, packaging it, mixing it, enveloping it… A feast for the eyes that is in keeping with the bouquets of flowers – changed weekly – and the impressive collection of black and white photographs that is continually evolving as new meetings take place. Her own. Because Florence Elkouby never stops. Filled with tremendous energy, this woman with her zest for life accumulates projects and stretches those in progress to give birth to other entities, other challenges. She will tell us about it at the end of this article. It’s the beginning of a new adventure for her and her team of enthusiasts. One thing is for sure, 2019 promises to be very exciting! Florence, who are you? Can you tell us about yourself? I’m a girl from the South, in love with Paris. One of my friends described to me recently as “the most Parisian woman in Marseille”. Coming from the south, I have brought with me the light, the sunshine and the colour. In Paris, I love the life, culture, fashion, the energy and the noise. I crave new encounters and new challenges. To tell you the truth, I never stop! 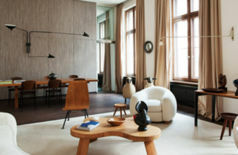 Tell us about your agency, L’Appartement. What is its story, what do you specialise in? L’Appartement was born as a result of a rare creative alchemy between three passionate Fashion and Design enthusiasts that led us to found our own agency in 2005 to advise, support and delight the most beautiful cosmetic brands. We are deeply committed to the DNA of brands and always prefer to evoke emotion rather than use lots of words. We combine colours, materials and images to guide the greatest cosmetic companies towards embracing modernity, with meaning and sensitivity. In 2017, the L’Appartement was renamed L’Appartement Parisien to further affirm the French touch that is our signature. Today, more than ever, we are selling Parisian charm, without ever falling into the trap of creating a caricature. The art of living runs through every thread of your life. How does it manifest itself at home? I say it every morning to my children: being in a good mood starts with being in a good mood. So to put myself in a good mood, whether it is to do with fashion, decoration or design, I hijack, I embrace, I blend, I embellish, I enhance, I colour, I share, and I blossom, a lot. I have made my “art of living” a sort of “art of wrapping”. It is my own way of adding enchantment to everyday life. Sofa made from black lacquered beech and natural cane. Made in Italy. Italian almond green velvet seat. Why did you choose this area? What sort of things do you do here? Ever since I arrived in Paris thirty years ago, the Jardin des Tuileries has always been my favourite Parisian garden. My three children took their first steps there, had their first ride, ate their first candy floss. 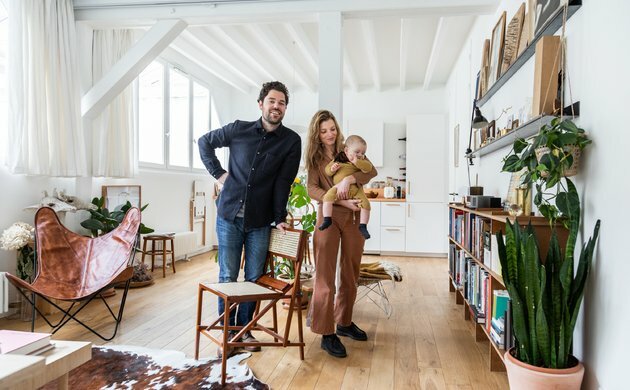 So, after the hectic Latin quarter, the ultra-chic Saint Germain des Prés, the charming Marais and a magical period spent on Île de la Jatte, for the well-being of my children and the “sea view”, living here, above this garden filled with 30 years of memories, became a natural choice. The icing on the cake is that Maison Plisson had the brilliant idea of setting up just recently in the Place du Marché Saint Honoré. My new HQ for a little cup of coffee in the morning, the Sunday roast, and the incredibly chic local food shops. I enjoy dining at Ferdi, in Rue du Mont Thabor, when my friend Alexis can find us a table. And at La Corte, a little Italian place tucked away at the back of a courtyard in Rue Saint Honoré. The cooking is authentic, colourful and unpretentious. How have you decorated your apartment? 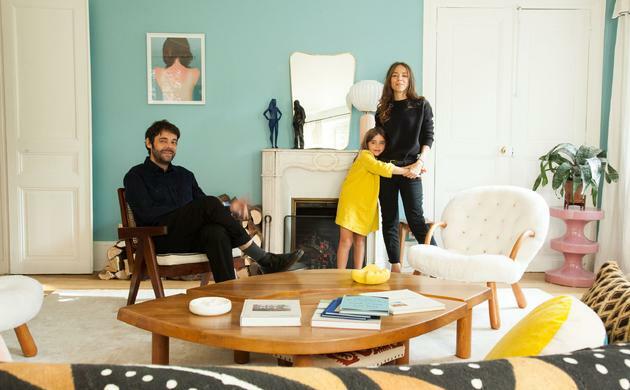 Do you lean more towards antiques or young designers? My previous house was stuffed with furniture and objects, picked up, inherited or brought back from my many travels. It had a bohemian, crowded, almost kitsch feel to it, which I loved. 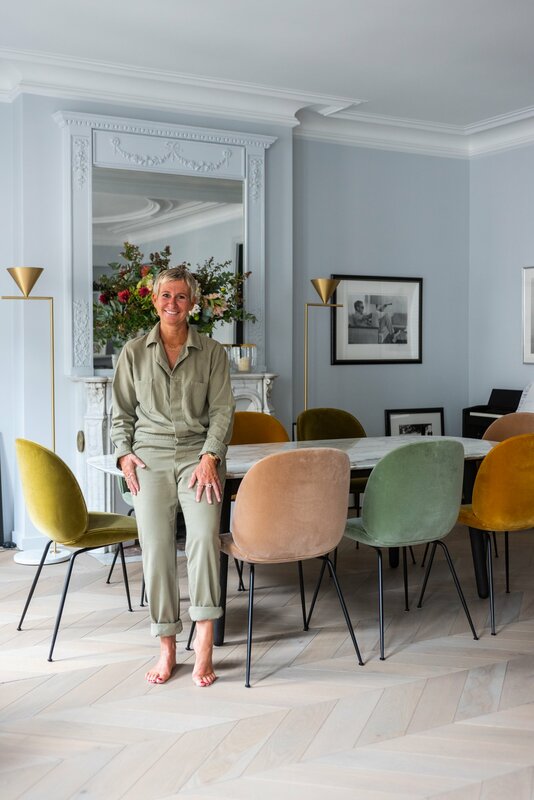 For this apartment, I wanted to keep a joyful and colourful atmosphere, but above all to focus on the Hausmannian details of the place with a more refined, more elegant and more Parisian style of decoration. I didn’t bring anything with me besides the Serge Mouille hanging, my first “signed” purchase, which immediately took pride of place In the hallway. And my collection of black and white photographs, which I continually add to with the things I fall in love with. For everything else, I mix and match colours, prints and designer furniture with joy and vitality. Do you have a favourite period in art or design? I am a fan of the 60s, of Pop Art, of the Factory, of Twiggy, and of Verner Panton and Eero Aarnio. 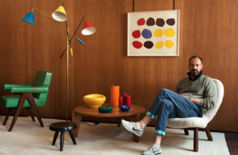 I love that colourful, optimistic inventive period, full of fun and a vast visual sensuality. At the moment, I like to put wallpaper on the ceiling, mix prints and - again and again - put green everywhere! 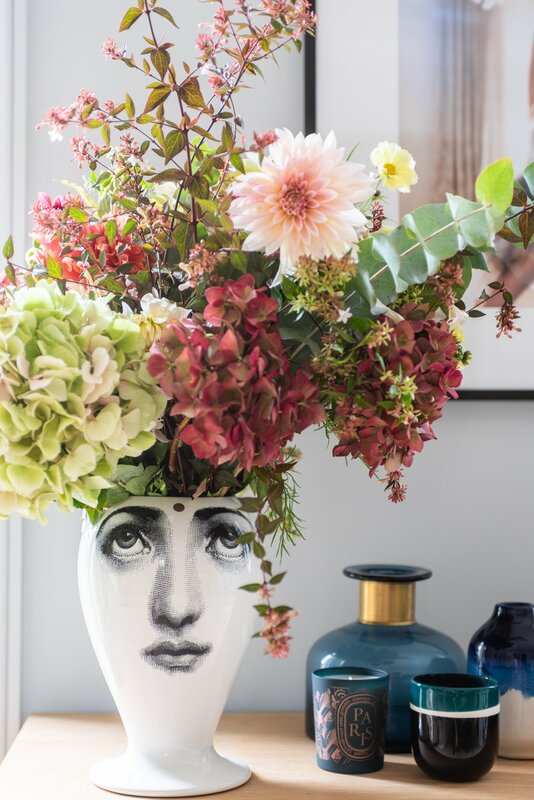 What are your current decorative obsessions? Putting wallpaper on the ceiling, mixing prints over and over again and putting green everywhere. I’m also obsessed with tiling, there are so many choices today! Every time I discover something new, I want to redo all the bathrooms. What does TSF mean to you? It’s a source of inspiration, with a cool and dynamic team and an innovative, chic and creative editorial style. Do you have a favourite TSF Collection product? The Cavallo sofa, in yellow of course, to bring a little bit more sunshine into my house. To develop L’Appartement Parisien into a trusted hallmark, a kind of guarantor, capable of carrying a range of products, a collection of furniture and accessories, and even, why not, to create and sustain an inspired location where we would gather together all those things we fall in love with. After working for years on branding, image, packaging and product, we are showing we are open to set design and scenography through our Instagram account @lappartementparisien, we want to go even further in design and creativity. This will be a natural evolution. Because when it comes down to it, it’s demand that stimulates creativity. 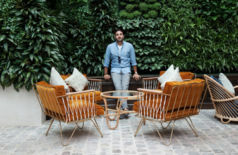 Tuileries: 360° View at So-An Cofounder's Appartement.